We are excited for our upcoming opening of Art on the Trails: Finding Solace in the Woods, which is scheduled for this Wednesday, June 7, from 6-8 pm. Now that all of art has been installed, it’s time to hear from the artists on a walk in the woods. We will have refreshments along the way. Continue on and stop at #9 again for more refreshments for going back to the kiosk. 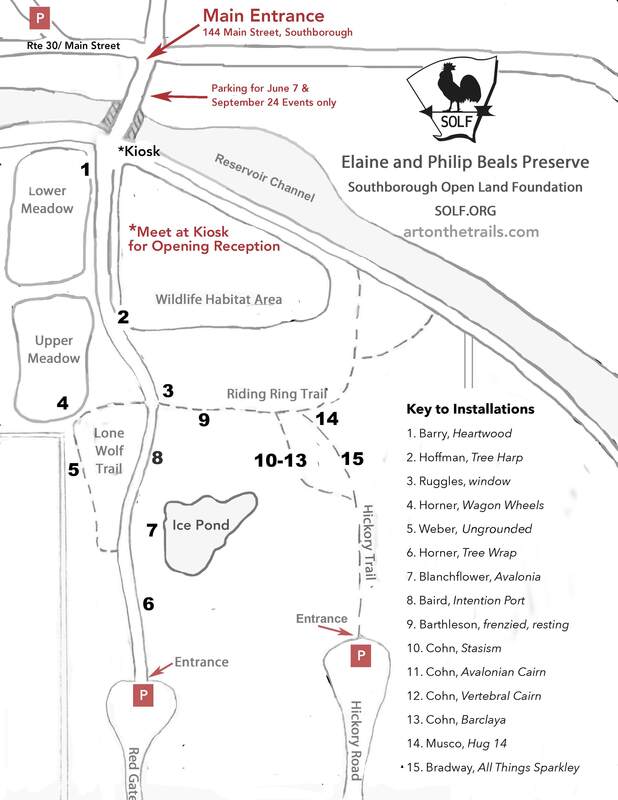 The attached map shows the route and location of each of the installations. We encourage the community including aspiring artists, poets and art lovers, to join our walk. how long will art be on the trails? The art will stay until the closing event on September 24th. What are the hours? When can I visit to see the art? What’s the address? The Preserve is open to the public any time. The Main Street entrance does not have parking at the gate as it is shared with a private home. You must park where it is indicated on the map. Are well mannered leashed dogs allowed on the trail? Would clean up after them of course. Yes, absolutely. Dogs are allowed off leash as long as you have voice control.